In stock -This product will ship today if ordered within the next 5 hours and 0 minutes. 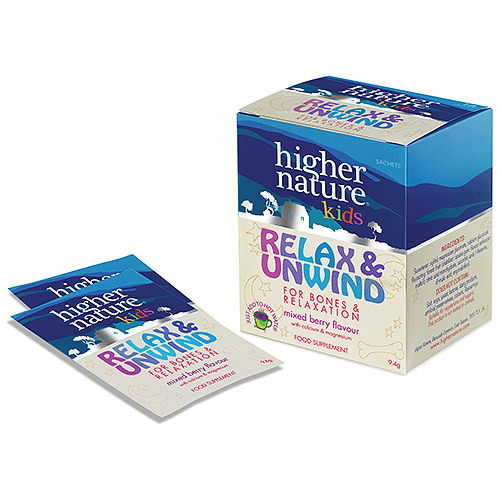 Higher Nature Kids Relax & Unwind is for any time of the day, but is most effective as a wind down drink just before bedtime. It is great for your active little ones to support their busy and physical lives. This formula protects bones during early years, containing calcium for normal growth and development. Magnesium is contained for maintenance of normal healthy bones, supporting young children. It is a delicious mixed berry flavoured drink, free from artificial flavours and sweeteners. Higher Nature is a company that was founded on a set of principles and a vision to provide high quality, well-researched nutritional products. This British, independently owned business was the brainchild of pioneering nutrition experts, Brian and Celia Wright, who wanted to make a significant contribution to the health of those using their supplements, through active ingredients at levels dictated by scientific evidence on safety and effectiveness. They would not market a product, even a best seller, if they were not convinced that it was beneficial to health. Sweetner: xylitol magnesium gluconate, calcium gluconate, flavouring: forest fruit (stabaliser: acacia gum; flavour enhancer: maltol); citric acid monohydrate, ascorbic acid, l-theanine, dl-malic acid, ergocalciferol. Salt, soya, wheat, gluten, lactose, dairy products, artificial preservatives, colours or flavourings. For children over 3 years: Blend 1 sachet into a mug of preferably hot, or cold, water until it dissolves. Do not feed xylitol to dogs; if consumed seek veterinary advice. Large quantities may have a laxative effect. 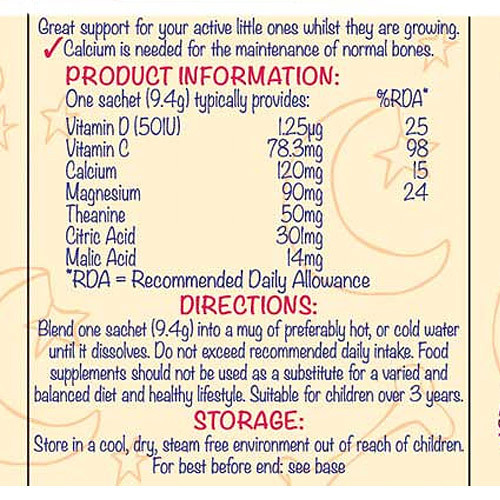 Below are reviews of Kids Relax & Unwind - 10 x 9.4g Sachets by bodykind customers. If you have tried this product we'd love to hear what you think so please leave a review. 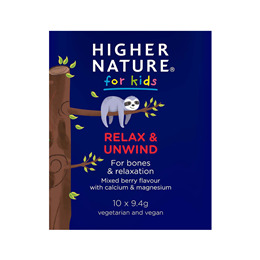 Higher Nature Kids Relax & Unwind is for any time of the day, but is most effective as a wind down drink just before bedtime. It is great for your active little ones to support their busy and physical lives.